Down a dark alley, at the corner of your eye something flickers, probably a trick of the waning light, or a stranger up to some banal task. But what hubris leads you to believe that you can understand what happens in and among these haunted buildings much less this ancient world? Such was the outlook of horror fiction trailblazer Howard Phillips Lovecraft. Born in 1890, Lovecraft took inspiration from his historic New England surroundings and beyond to create tales of otherworldly standing stones, hidden cities older than time, and simple homes that exude unknowable evil. Lovecraft’s prose placed a distinct emphasis on the power and mystery of location, taking time in each of his stories to create a rich sense of place where his otherworldly gods and tentacled horrors could thrive, sending both his characters and his readers into madness. Turn out the lights, pray to your dead gods, and join us while we dare insanity to bring you a list of the real world locations both horrible and mundane, that inspired some of Lovecraft’s most famous works. Cthulhu Fhtagn! While many of Lovecraft’s stories take place in his shadowy mirror of New England, he also found inspiration in locations farther afield, but no less steeped in hidden history. One such example is his story The Rats in the Walls (1924) which takes place in an ancient English priory. The tale concerns a character named Delapore as he returns to his family’s ancestral home and discovers a hidden city of untold age beneath the estate, and a history of cannibalism which eventually overtakes him. Lovecraft’s description of Delapore’s (the name deriving from “de la Pour,” an actual Irish baronage) sinister estate and its subterranean secrets share many similarities with a contemporary account of the real life holy site, St. Patrick’s Purgatory. Founded in the 15th century, St. Patrick’s Purgatory is said to be the location where St. Patrick discovered a gateway to hell, and was shown terrible visions of its punishments. Encompassing the lake-bound Station Island, the resulting church grounds maintained the worship and upkeep of the site for thousands of years, and it continues to be a popular pilgrimage site to this day. Most of the buildings still recall the Middle Age stone architecture established in the 15th century, especially the ornate basilica crowning the island. The site also includes such unique features as a labyrinth, gendered dorms, and even a small shop. While Lovecraft probably did not visit the site himself, his contemporaries’ descriptions of crumbling rectories over an ancient gate of pure evil can be felt throughout the Delapores’ rat-infested nether-city. Undeath, grave robbing, and grotesque monsters are not unexpected in Lovecraft’s tales, but when he needed a backdrop for these gruesome features in his unsettling Pickman’s Model (1927), the author did not even need to invent a location. In the story, a man named Thurber visits artist Richard Upton Pickman and views his terrifying works of art depicting chilling graveyard scenes and eventually a ravenous ghoul that appears to be all too real. Pickman’s underground studio is located in the crumbling North End of Boston, which is also the real-world location of Copp’s Hill Burial Ground, mentioned in the story as the backdrop of many of Pickman’s horrific scenes. The Copp’s Hill graveyard is the second oldest cemetery in Boston, having been established in 1659, and it has slowly expanded ever since. The land contains many notable graves including those of Puritan minister Cotton Mather, as well as Robert Newman, the man who placed a trail of lanterns for Paul Revere’s midnight ride. By Lovecraft’s day, the graveyard had fallen into disuse and many of the oldest headstones would have been overgrown ruins arranged in an unnatural asymmetry, looking like nothing so much as the perfect haunt for ghouls. Like many of the previously enigmatic locations on this list, the Copp’s Hill Burying Ground is now a popular location for tourists taking in the historic resting places. However with hundreds of oddly-angled, sinking gravestones and over 272 tombs, you are still likely to experience the unsettling aura that inspired Lovecraft, and through him his painter Richard Upton Pickman, among the mouldering corpse-field. Specifically referenced as the home of prophetic sculptor Henry Anthony Wilcox in Lovecraft’s famous 1928 short story, the Fleur-de-Lys Studio in Providence, Rhode Island’s College Hill area wears its potential for madness on its sleeve. In the story, the artist locks himself away in the studio while he sculpts a totem of the long-sleeping god Cthulhu based on his cosmic visions. In real life, the studio seems like just the place to create such truly outsider art. Built in 1885 by painter Sydney Burleigh as a home and studio for the elite Providence Art Club, the building features one of the most eclectic façades in all of New England. Wedged between the ordered horizontal boards of the traditional Colonial buildings the studio features a series of crude, hand-carved bas-reliefs among a faux-medieval oak grid. The individually carved images are stylized representations of various forms of art, such as sculpting and painting. In addition to the prominent art tributes, the building features such bizarre touches as small expressive faces among the boards and a bold yellow color scheme. Elder gods from beyond space and time sleeping in ruined cities beneath the waves, or just beyond our perception, were all in a day’s work for H.P. Lovecraft, but even these otherworldly locations had roots in reality. In “The Call of Cthulhu”, the unfortunate investigators looking into the mysterious Cthulhu cult discover the location of the horrible city of R’lyeh, where the non-euclidean geometry of its ruins drives men mad and an unthinkable god sleeps among its titanic stones. While this is one of Lovecraft’s more outlandish creations, R’lyeh was inspired by the megalithic ruins at Nan Madol. Consisting of a series of seemingly impossible stone structures separated by a network of canals, the ruins were likely inhabited by the ruling class of the local Micronesian dynasty although no one is sure who actually built the ruins or even how. The large stones that comprise the site do not seem to have come from any quarries in the area and no evidence of a construction method exists, although according to legend, the structures were built by sorcerers using black magic, and even a dragon. Despite multiple archeological efforts, Nan Madol’s ancient mysteries persist to this day with little explanation. Although Lovecraft did have his theory. Lovecraft’s posthumously released 1937 short story, “The Shunned House” is the outlandish tale of a man obsessed with an abandoned Colonial home which carries a history of death and misfortune. As the man investigates the object of his curiosity, he encounters unearthly fungi, ghosts, and ultimately the remains of an unfathomable being. However, unlike many of Lovecraft’s tales, this one isn’t that far from the truth. The titular “Shunned House” was based on the real life home of unlucky Colonial merchant Stephen Harris. The simple clapboard abode was a multi-floor home of modest rectangular design in Lovecraft’s day, and was the subject of a grim local legend. The Benefit Street dwelling (which is the address both in real life and in the fictional story) was built in 1763 on the remains of a French Huguenot burial site, and subsequently brought nothing but misery to the Harris family. It is said that upon the home’s completion Harris began falling into financial ruin, which was quickly followed by the death of several of his children. After years of mysteriously catastrophic luck, Harris’ wife went mad and had to be confined to the upper floors of the home where they say she would scream tirades in French, a language she never learned, just as Dr. Whipple is seen to do in Lovecraft’s story. The Stephen Harris House still remains on Benefit Street, having been renovated many times over and painted a placid yellow color, coincidentally echoing the haunted vapor described in the story. Yet thanks to Lovecraft’s detailed fiction, the site’s sinister past won’t be forgotten under a simple coat of paint. Among the many locations in Lovecraft’s shared “Cthulhu mythos” universe, sometimes known as “Arkham County,” one of the most prominent is the supposedly prestigious Miskatonic University. Featured in a number of the author’s stories including The Dunwich Horror, At The Mountains of Madness, and The Shadow Out of Time, Miskatonic University is famous for its collection of occult tomes and eccentric staff such as Herbert West —Reanimator. And all this is based on a Massachusetts girls-only school called Bradford College. Established in 1803, and operating until the year 2000, the Bradford school was a verdant institution consisting mainly of an immense brick building complete with hidden tunnels and a storied history. During Lovecraft’s time, Bradford was a finishing school for women (fictional Miskatonic, inversely, was an all-male school) and the community surrounding the school was sharply economically divided, presenting the students and faculty with a diverse cultural community among the historic mystique of the period campus. While Miskatonic University also echoes Ivy League schools such as Harvard and Yale, Lovecraft was known to have spent time at the Bradford campus while he dated a student. In his fictions, Lovecraft established that Miskatonic University contained one of the only extant copies of the evil “Book of the Dead”—the Necronomicon. Likely in response to his stories, a local legend has evolved in which Lovecraft buried a real-life Necronomicon beneath Bradford College’s small lake. Whether fiction or non-fiction, Miskatonic or Bradford, the old buildings still stand and now house a decidedly less terrifying Bible college. Short story “The Dunwich Horror” (1929) tells the tale of a fictional town blighted by supernatural rot and the malformed scion of an elder god who uses the town’s inherent evil to bring his master into our world. Lovecraft describes the ancient standing stones outside the town, which in his story hold the arcane secrets of its past. Rumored to have been built by the area’s Native American tribes, but looking nothing like their influence, the structures point to a longer, stranger history. Of course this fictional site has a true inspiration in “America’s Stonehenge,” otherwise called Mystery Hill. Located in the New Hampshire wilderness, America’s Stonehenge holds no direct connection to its European namesake, yet it shares just as much mystery. The site consists of a number of standing stones and structures whose muddy origins have been linked alternately to pre-Colombian civilization or 18th century farmers. However the stones were erected and to whatever purpose, they continue to spark the imaginations of tourists to this day. Lovecraft is known to have been interested in standing stones throughout the nation, and he visited America’s Stonehenge specifically around 1928, which would have been well timed to inspire the origins of Dunwich and its host of horrors. Spending most of his life in Providence, Rhode Island, it is easy to speculate that it was simple proximity which sparked Lovecraft’s fascination with New England and its attendant horrors, but in his early 1900s lifetime much of the area’s puritanical superstition was also much closer to the surface. While this influence can be seen in the fear and xenophobia present in much of his writing, the author would approach this history head on in his tale, “The Dreams in the Witch House” (1933). While the story is set firmly in Lovecraft’s fictional Cthulhu Mythos, the narrative couches the narrator’s otherworldly discoveries in the framework of the Salem witch hysteria, as young Walter Gilman rooms in a former witch’s house and experiences a series of dreams that might not be dreams at all. Luckily for those looking to share Gilman’s experience there is the very real Salem Witch House. The Witch House, or more mundanely the Jonathan Corwin House, was the home of one of the judges involved in the deadly Salem witch trials during the 1600s. The house itself is a boxy grey home representative of 17th century American architecture, mirroring the unadorned lifestyle of its Puritan inhabitants. With its mundane construction and conversely bloody history, the site is a perfect expression of Lovecraft’s paranoid style. 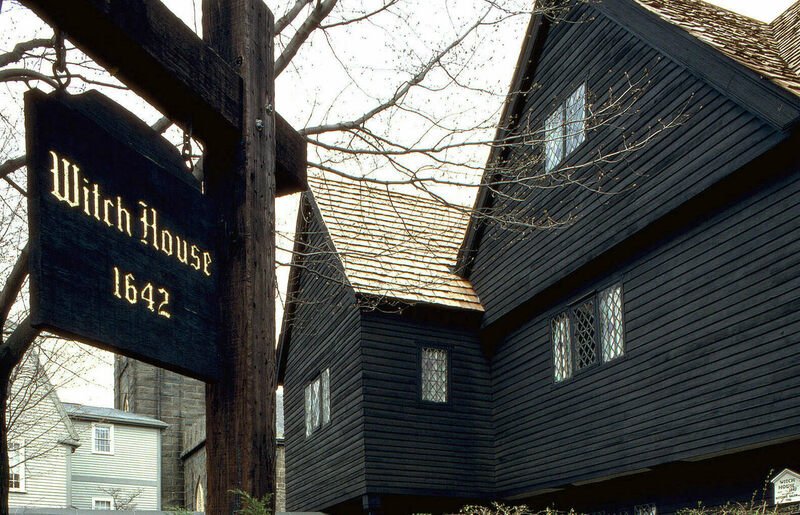 The Jonathan Corwin House is now one of the only remaining relics from the Salem witch trials. Renovated to look like its state, it now houses a period museum which is open seasonally. Just don’t fall asleep. Despite his often dark and horrifying subject matter, Lovecraft was not immune to the influence of charm and beauty, especially that of his lifelong home of Providence, Rhode Island. This is readily evident in his late tale, “The Haunter in the Dark” (1936). In the story, Robert Blake (himself an allegory for fellow writer Robert Bloch) moves back to Providence and into a peaceful historic home, before being swept into the eldritch mysteries of The Church of Starry Wisdom. While much of the story focuses on Blake’s descent into madness and eventual death, Lovecraft spends a large portion of the introduction lovingly describing what would be, in reality, his final home: the Samuel B. Mumford House. This unadorned home was built in 1825 and is an example of the early Colonial slat-board construction style that is prevalent throughout Providence. Lovecraft moved into the home in 1933 and lived there until he was moved to the hospital where he would pass away from intestinal cancer and malnutrition in 1937. As described in the story, the home had a relaxing view of the city’s rooftops and sunsets, a constant sight which was likely a welcome respite from the author’s darker fantasies. Unfortunately, Lovecraft’s idyllic view can no longer be seen as the house was moved to another address in Providence and despite being the author’s final home, the historic plaque only remembers Samuel B. Mumford. With the ubiquitous themes of madness and psychic distress in Lovecraft’s work, its no wonder that one of his more famous creations is the Arkham Sanitorium. The location itself is actually not widely prevalent in Lovecraft’s fiction, most prominently being named in “The Thing on the Doorstep” (1937). Nevertheless the concept of a Lovecraftian institution housing those driven insane not by mental illness, but by exposure to terrible truths, has pervaded the cultural consciousness and inspired horror films and even Batman’s own Arkham Asylum. But the location that inspired Lovecraft himself and many of his characters indirectly was the Danvers State Hospital for the Criminally Insane. An imposing Gothic structure of red brick and cascading peaked roofs, the hospital was referenced by name in a number of Lovecraft’s stories before he fictionalized the location. Opened in 1878 in rural Massachusetts, the isolated facility contained patient rooms, a chapel, staff dorms and more as additional annexes were added over the years, all connected by octagonal towers and a warren of underground tunnels meant to keep things running during the winter months. In addition the fearful facade and labyrinthine interiors, the compound even featured its own graveyard where those condemned to a life of insanity could be laid to rest. After inspiring dreams of terror and death for almost a century, the Danvers Hospital was finally closed in 1992 and has since been converted to high-end condominiums, in an asylum-to-condo move so unsettling even Lovecraft would have been shaken. H.P. Lovecraft’s literary legacy of cosmic horror, hidden knowledge, and the terrible unknown continues to inform the work of nearly every science fiction and horror creator to this day, and it all began in the quiet surrounds of his trusted Providence. If Lovecraft was able to take inspiration from both the amazing and quaint places listed above, what new and interesting location might inspire your next nightmare in the waking darkness?